Imran Khan is a great leader in Pakistan, He is a leader of the youth of Pakistan, Youth of Pakistan like Imran khan because he is brave leader. 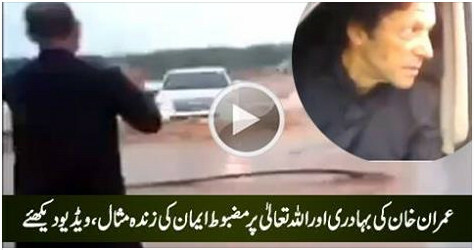 The video shows that how Imran Khan crosses the bridge of Flooding water. No any other leader in Pakistan as much brave as Imran Khan, He take a risk to cross the bridge finally he succeeded. The ability to move forward in spite of fear. After Crossing the bridge Imran Khan said Life is only in the Hands of Allah. Imran Khan Trust on Allah watch this amazing video.